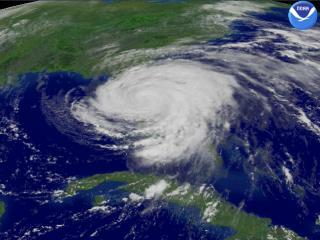 The center of Hurricane Charley was located about 35 miles south of Myrtle Beach, South Carolina. Click here for image and data in a new window. 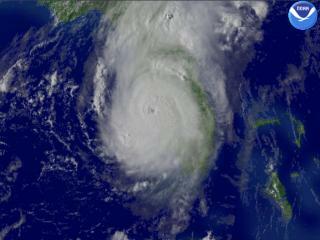 Hurricane Charley is seen just west of Fort Myers, Florida at 3:15 PM EDT. Charley makes landfall at Fort Myers at ca 3:50 and is going to hit the Charlotte Harbor area - Port Charlotte and Punta Gorda. Hurricane Charley approaches Florida. 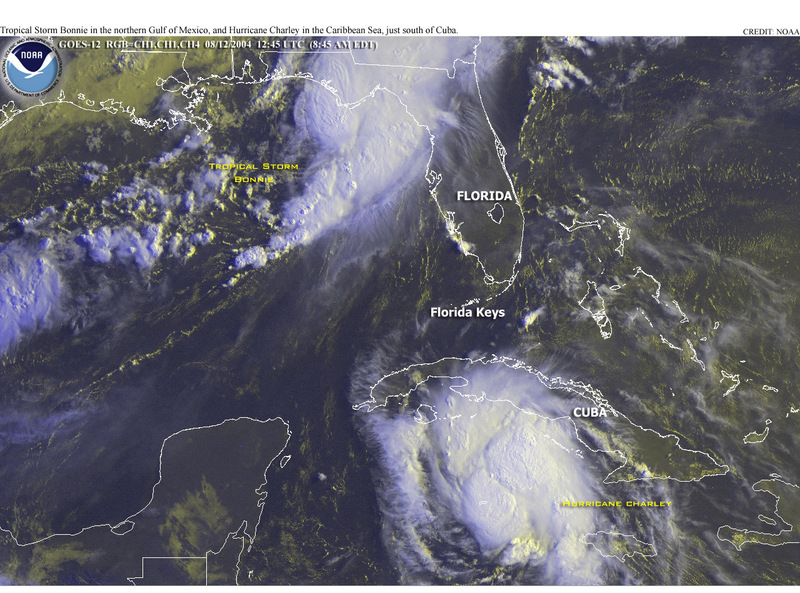 Hurricane Charley is seen just west of Fort Myers, Florida at 3:15 PM EDT. 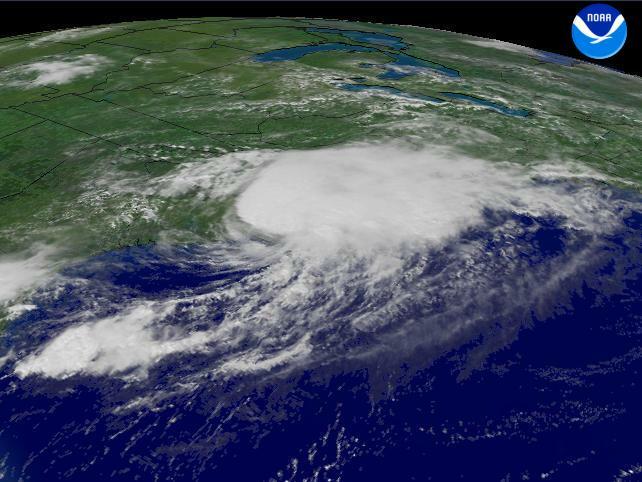 At 2:00 PM EDT, The National Hurricane Center reported winds estimated to 145 mph near the eye of the storm. Movement was to the north-northeast at 20 mph. Image processed from data taken from GOES-12. This imagery is available at: http://www.osei.noaa.gov/OSEImedia.html or http://www.osei.noaa.gov/Events/Current/TRCcharleyb226_G12.jpg Other imagery is available at http://www.osei.noaa.gov/Events/Current/ If you use this imagery for any purpose, please credit NOAA. 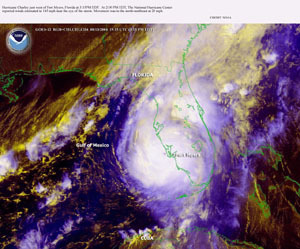 Just after 4 p.m. on Friday, August 13, 2004 Hurricane Charley struck our city of Port Charlotte, Florida with 145 mph winds. We were told the hurricane would hit south of us so we did not evacuate. The storm stalled near Sanibel Island, turned north and gathered strength and at 3:30 gale force winds battered us with the worst part of the front of the hurricane. Then the eye passed over and there was an eerie stillness until we were hit by winds in the opposite direction as the hurricane moved inland. Charley cut a path from Port Charlotte (location) through Arcadia into Orlando and on to Daytona. In its path lay destruction, loss of life and billions of dollars in lost property. The infrastructure of Port Charlotte was leveled. There was no phone, electricity, water, traffic or street signs. Downed power lines and trees blocked almost every road, making travel impossible. Property damage was so extensive that normal landmarks could not be recognized. My sister and I both had trees fall on our houses and roofing blown off. I had 16 trees blown over and they had to be cut up and my yard looks so desolate with stumps all over. In addition my wooden stockade fence was blown over and has to be replaced. I lost my best pink grapefruit tree and a couple palm trees bent over. The other trees lost were red cedar trees that were so beautiful. In addition my skylight was smashed and a window in my Florida room was shattered. My mailbox sailed away - the post was snapped off at ground level. I live near a wooded area and the hurricane winds shredded the leaves from the trees and plastered them all over my house. I had to take a razor blade and scrape the leaves from my windows. There's still a lot of work to be done, such as getting a new roof - but all the roofers are booked up 6 months ahead so no chance of getting a roof this year. The Army Corps of Engineers (Operation Blue Tarp) is going around putting tarps on 40,000 houses in town - they haven't been around my area yet. But it should be colorful to see blue tarps on all the houses. We were asked to pile all the debris: trees, branches, shingles, metal, wood, etc. at the street for pickup. There are mountains of stuff in front of every house and it's like driving along a roofless tunnel when going down the street - some debris is piled higher than the houses. They predicted it would take 3-4 months to pick it up, but since Hurricane Frances came through and destroyed more trees, the clean-up will take much longer. Our county was blanketed with volunteers from everywhere - passing out food and other necessities. I have more boxes of crackers than I'll ever be able to eat. A week ago some volunteers came from Sarasota (where there was no hurricane damage) and they worked all day cutting up trees and hauling the stuff to the street for pickup. They worked at my house and my sister's house - and they've offered to come back after this latest storm to help if we need them. They wouldn't accept money or food - they came prepared with all they needed to get the job done. We all had a little cry when they left. I called them Charley's Angels. Charley was a more powerful storm and the winds sounded like 100 airplanes flying overhead - it destroyed whole areas of town. Our main street is just rubble. 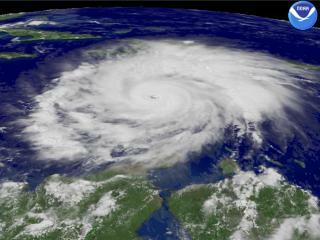 Hurricane Frances wasn't as powerful - it was mostly wind and rain. My backyard is flooded, with broken fence pieces floating in it. The town of nearby Punta Gorda is under 2 feet of water and their entire main street was destroyed. It is a small town with many historical buildings that were shattered. Our three hospitals were damaged and couldn't receive patients. Emergency medical centers were set up in tents to handle injuries. Thirteen of our fire stations were damaged - several 25-ton fire trucks were lifted and carried away. Seven of our schools were damaged and have to be rebuilt, so our schools are handling classes in morning and afternoon shifts. Animated image of hurricane Charley hitting Port Charlotte. Hurricane Frances regional imagery, 2004.09.05 at 1615Z. Centerpoint Latitude: 27:55:21N Longitude: 81:06:28W. We were without power here for 12 days - no lights or TV and we lived with candlelight and flashlights. The temperature was in the 90s so our clothing was drenched with sweat continually. Each day we had to go to stations to pick up ice, water and food as we had no way of cooking or preserving anything. The military was posted at all entrances to the city and no one was allowed in without a good reason. The curfew was recently lifted. There were ca 10,000 power installers from around the country working 16 hours a day to rebuild the power grid so we could have electricity. It rained on them every day and I'm sure they hoped to never see Florida again. But they're already back here and in other areas working to restore power to 2 million people. As soon as we had power, I took a warm shower and washed my hair (try bathing and washing hair in cold water for 12 days - not much fun!). We couldn't drink the city water - it was polluted. Our airport was destroyed - they estimated $25 million to fix it up. They estimated $20 million to clean up the harbor of sunken boats, debris, etc. Over half the buildings in town were damaged and it will take years to rebuild. There's a shortage of material: roofing, cement, plywood, gasoline, etc. The strange thing was that we could not telephone anyone in town or in the state, but we could make and receive long-distance calls from out of the state and I even had calls from Finland! I asked my brother-in-law in Mich. to send e-mail to some people telling them we were safe. I didn't know the addresses of most of you, so couldn't contact you. Some of the food we received was MRE (military meals ready to eat). I saved a few for souvenirs. They were rather tasty, but we couldn't heat them so had to eat them cold. There were no stores or restaurants open and when we heard that a little restaurant had opened with a limited menu, we dashed over and had our first hot meal. It was baked cod and tasted soooo good. All in all two hurricanes howling over us for hours are experiences I hope to never repeat - although now we heard that Hurricane Ivan is out there somewhere - here he is referred to Ivan the Terrible. So by the weekend we should know whether another hurricane is on our doorstep. It has been 40 years since Hurricane Donna swept across our area. Guess we were lucky all the years since. Latest news indicates that Ivan has grown into a strong category 5 hurricane which could make it the strongest hurricane to hit the US. There have been only 3 category 5 hurricanes since records were kept and Ivan is stronger than Hurricane Andrew. Excerpts from The Morning Star. Hurricane Ivan regional imagery, 2004.09.09 at 1745Z. Centerpoint Latitude: 14:36:53N Longitude: 72:01:19W. Hurricane Charley From Wikipedia, the free encyclopedia.